I was just about to fall asleep when I got a text…the text. That seems to be the way of the world these days. And, still, I’ve yet to go to sleep. What we know about the circumstances of his “sudden and unexpected” death are sketchy, at best, and we wait for further, but here’s what we do know: Seattle’s Chris Cornell was a rock god among mortal men. Bless his heart, Cornell flexed his four octaves of awesome and vocal cords of steel all over Soundgarden, Audioslave, Temple Of The Dog…plenty of us are more than grateful for that. After Soundgarden abruptly dissolution in 1997, Cornell moved on to form the supergroup Audioslave with 3/4ths of Rage Against The Machine. And then came Soundgarden and Temple of the Dog, reborn. Resurgence and reunions, worldwide tours and festivals and making many a fan’s wet dreams come true with the arrival of fresh and deadly new music with the 2013 album, King Animal. 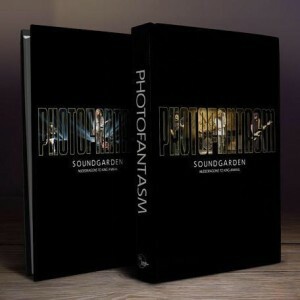 The love for all things Soundgarden/Chris Cornell even manifested itself in a one-of-a-kind, wholly fan-created collector’s edition, ode to the band book Photofantasm Soundgarden: Nudedragons To King Animal by Jaye and Mike English. A book that was created with the support of Vicky and Chris Cornell and one that I am genuinely proud to have been a contributor to. I had never been to Chicago’s Lollapalooza before and never thought that I would ever attend, but when Soundgarden was magically added as headliners in 2010, I made all kinds of questionable moves including taking time off from work that I couldn’t afford and spending money that I didn’t have in order to get there…be there for the band’s biggest show in 13 years. And when they opened their explosive set with “Searching With My Good Eye Closed,” I knew that I made the right decision. But then there was something alt: Euphoria Morning (re-dubbed with Cornell’s originally intended title, Euphoria Mourning, in 2015). It was 1999 and his first solo album (out of five) and, if you’re not familiar, I highly recommend that you dig in. As most music fans have their sacred “desert island disks,” Euphoria Mourning has been one of mine for well over 15 years. It’s a dark yet very lucent piece of work that has stood up well over time – Cornell even received a Grammy nomination for it. Yes, he was far from clean and sober when he recorded it and it was divergent from all that came before, but it is and was reflective of who and what he was at the time, as well as artistically, creatively on point. From the gently suicidal “Preaching The End Of The World” (a poignant but unfortunate song in light of what appears to have happened) to a romantic nod to his star sign “Moonchild” (he was a Cancer), to the defiant “Can’t Change Me” to the serpentine and metallic grind of “Pillow Of Your Bones” to the sexual “Mission” to his personal ode to Jeff Buckley “Wave Goodbye”…this was Cornell stepping to the side of the dynamic grungy and metallic rock that had already made him an icon and fleshing out his emotional lyricism versus skull-crushing guitar rock. Yes, I highly recommend that you dig in, so please do. This is literal mourning with a dose of euphoria because here many of us sit at a loss with this loss, yet reveling in the glorious that we’ve experienced by way of a vinyl record, CD, music video or having had the pleasure of witnessing…feeling…the viscerally awing power of Cornell live in any of his musical incarnations. “You don’t know how important someone is to you as an artistic influence until suddenly they’re gone. I’ve certainly been having that experience. How prophetic to a tee, those words. That I am so goddamned glad to have lived at a time when such sonic epicness ran rampant among the earth is an understatement, because no one can or will ever be able to touch or replicate what Cornell has given and left behind. For so many reasons musical and otherwise, thank you so much for coming, Chris. If you’re in need of help or hope, please reach out for it.